Nuthatches appear to have learned to understand a foreign language — chickadee. It’s not unusual for one animal to react to the alarm call of another, but nuthatches seem to go beyond that — interpreting the type of alarm and what sort of predator poses a threat. When a chickadee sees a predator, it issues warning call — a soft “seet” for a flying hawk, owl or falcon, or a loud “chick-a-dee-dee-dee” for a perched predator. The “chick-a-dee” call can have 10 to 15 “dees” at the end and varies in sound to encode information on the type of predator. It also calls in other small birds to mob the predator, Christopher Templeton of the University of Washington said in a telephone interview. “In this case the nuthatch is able to discriminate the information in this call,” said Templeton, a doctoral candidate. The findings by Templeton and Erick Green, an associate professor of biological sciences at the University of Montana, are reported in this week’s online edition of Proceedings of the National Academy of Sciences. Templeton had been studying chickadees and noticed their varying response to different alarm calls, so he recorded them and watched the responses. He found the songbirds warned of greater danger from small, agile raptors such as the pygmy owl rather than something larger and less maneuverable, like the great horned owl. The article contains more information, including a couple of audio files, and links to previous articles: Do starlings recognize grammar in songs? 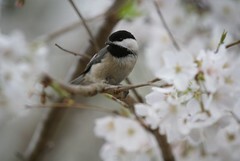 and Chickadees chirps reveal surprising smarts. There are 1 reader responses to "Some Nuthatches Understand a Foreign Language: Chickadee". At two species of monkeys (I believe some kind of South American monkey and some African, or Asian macaque) have been seen performing false alarm calls to make higher-ranking members in their troop scatter so they can get their food. It is usually low-ranking individuals who don’t have good food access who use this trick. The monkeys, being smart, eventually get wise to this trick and stop believing that individual. I don’t think any great apes have been observed doing this, though.